There’s no good time for a flood, but late August has to be the worst for a farming community. The Schoharie Creek ran up over its banks when Hurricane Irene hit during that time of year in 2011, punishing the area in and around the town of Schoharie in upstate New York, with a disaster that killed livestock, ruined crops, and left homes and business under water. Along with governmental assistance came help from the community, and one group, calling itself Schoharie Recovery, plunged into the thick of the disaster with food for the displaced residents. It was a successful enough program to suggest that there was cause to continue even after the damage had been cleared, and Schoharie Area Long Term (SALT) Development was formed. “Five years later, we’re still looking for new ways to move forward,” said Emily Davis, one of the dinner hosts participating in the Savor Schoharie Valley local food festival’s moveable feast, which raises funds for the continuing effort to rebuild and develop the rural economy in Schoharie County of upstate New York. “The valley has always been oriented towards food. We have the Carrot Barn, the Apple Barrel Country Store, and so many individual farmers.” SALT held its third annual Savor Schoharie Valley festival on Saturday, October 22, a blustery evening laced with rain that reminded us of the area’s seasonal volatility. The festival is a fund-raiser that introduces people both to the county’s food and to its hospitality. The event began and ended at Schoharie’s Lasell Hall. This is an imposing 18th-century tavern in the village center, a building now owned by the Daughters of the American Revolution who, several decades ago, established the town’s first library here, and who more recently restored the lower-level of the house from the damage it sustained in the flood. Like most houses of that age, it’s a warren of small rooms and many hallways. 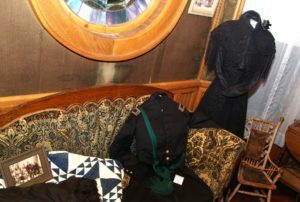 The main gathering room, to the right of the hallway, featured a number of appetizers that included meatballs from Hubie’s Restaurant & Pizzeria, crudité from the Apple Barrel Country Store, bruschetta from Chieftains Restaurant, and fast-vanishing potato balls from the Bull’s Head Inn. With the centralization of so much of the area’s farming and manufacturing, these towns tend to embrace whatever history persists in old ledgers and faded photos. At the upstairs table where Jefferson historian Ingrid Zeman sat were two program booklets from that village’s Maple Festival, which began on a green surrounded by 120 maple trees. But, even as Jefferson shared a table with Cobleskill, so too was the Maple Festival sent several years ago to the larger Cobleskill fairground. If there’s a single lesson to be learned from this evanescent history, it’s that nothing remains the same. 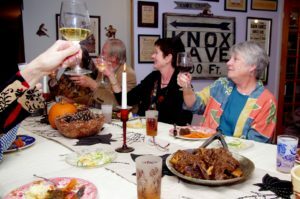 My wife and I dined at the home that host Davis shares with Mike Warner, located on a high-enough hill to have escaped damage five years ago, although they nevertheless helped to spearhead the area’s food relief back then. And they’re still cooking: squash for the soup that started off our meal came from nearby Schoharie Valley Farms (known to locals as the Carrot Barn), which also supplied the potatoes (mashed with Cowbella Dairy butter from Jefferson), carrots (more butter), cabbage for the salad, and onions for everything. Even the meat was local, with beef short ribs from Schoharie’s Wrighteous Organics. Garlic and herbs were supplied by Fox Creek Farm in Gallupville, and apples for the cider were harvested right on the property. It was a similar story at the other hosting houses. Paul Turner & Dee Pendell cooked and served a meal at the Schoharie home of Georgia VanDyke that included chicken from Cobleskill’s Abbas Acres, corn (for chowder) from Cold Spring Farm (Lawyersville), bacon from Sap Bush Hollow Farm (West Fulton), potatoes and onions from Summit Naturals (Summit), Sharon Orchards McIntosh apples (Sharon Springs), Buck Hill Farm maple syrup (Jefferson), peppers from Shaul Farms (Fultonham), and KyMar Farm Winery apple wine (Charlotteville). Abbas Acres also supplied the chicken served with the gluten-free fare prepared by David Chancey and Doug Guevara, with Chancey’s own garden the source of produce served both fresh and pickled, and free-range eggs from right next door. Richard & Marilyn Wyman showed that local can be exotic by preparing a cream of shiitake soup with their own mushrooms, and moussaka with eggplant from Barber’s Farm (Middleburgh) and lamb from Hessian Hill Farm in Berne. Kuhar Family Farm is across the county line in Rensselaerville (Albany County), but that didn’t stop them from participating. They offered a choice of pork sausage or meat-free lasagna at the historic Dr. Best House and Medical Museum in Middleburgh, where guests dined in a beautiful, dark-paneled room that featured, as a table decoration, a skull from Dr. Best’s collection of anatomical examples. 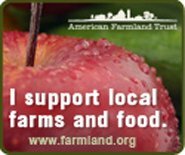 Of course, buying any of your food locally has a political component because you’re fortifying the economy of your neighborhood. It also tends to be healthier and, as this event proved, there are fascinating resources and history to be discovered in and around those nearby farms.